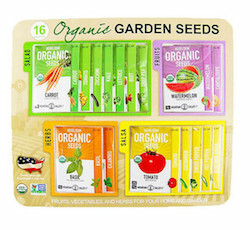 Includes 1 packet each organic seeds. Fruit: Crimson Sweet Watermelon and Hales Best Jumbo Cantaloupe. Herbs: Coriander Cilantro and Italian Large Leaf Basil. Vegetables: Beefsteak Tomato, Blue Vates Kale, Black Beauty Zucchini, Cal Wonder Sweet Pepper, Detroit Red & Gold Mix Beets, Evergreen Bunching Onion, Gourmet Mix Lettuce, Jalapeno Hot Pepper, Marketmore Cucumber, Scarlet Nantes Carrot, Sugar Snap Peas and Yellow Pear Cherry Tomato.